On an autumn afternoon in 2012, near a small central Ohio liberal arts college, Professor Robert “Bob” Anderson returns home to find Susan, his wife of 40 years, waiting for him. They are celebrating their anniversary, and their three children are expected to arrive shortly. Anticipating the arrival of his eldest son, James, Bob immediately starts drinking. The Oxford educated philosopher has never believed in any supernatural powers. His son is the pastor of a 6,000 family fundamentalist Christian congregation in the Dallas suburbs, as well as the host of a daily evangelical television program. Their opinions frequently differ. Bob tends to think his son is a little crazy, and James thinks his father is probably going to hell. Susan, who has a PhD in English Literature from Ohio State, and teaches at the same college as her husband, hits the bottle as well. James generally leaves his mother alone, though she is only slightly more religious than her husband. Rather than simply denying there might be a heaven, she has her hopes, though her idea of heaven mostly seems to involve hanging around with a young Warren Beatty, and not joining the celestial choir. Knowing father and son will inevitably start arguing, she concludes that a certain amount of alcohol may make it all a little more bearable. When James arrives the arguing soon starts. Despite their differences, the debates have always remained more or less cordial. 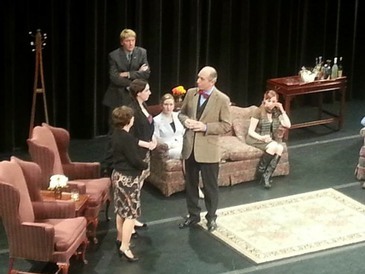 This time the fussing is interrupted by the arrival of the Andersons’ daughter, Ellen, and her husband, Mark Winston. Then their youngest son, George, arrives with his roommate, Eric Simpson. When George and Eric reveal that they plan to move to New York and be married, any debates between Bob and James suddenly seem very minor indeed. James becomes extremely vocal, reminding his younger brother that he was captain of his high school football team, and even used to date cheerleaders. George doesn’t help the situation by pointing out that he was dating another football player at the same time. Bob and Susan try to keep things together, but can’t help wondering how it is that James seems to be the only one in the family who never realized his brother was gay. Eventually, the yelling drives the parents out onto the front porch. They return, perhaps a bit more enlightened, when they realize that all the liquor is still in the living room with their children. And just when it seems things may be reaching some sort of climax, Bob’s secretary, Carol Burgess, arrives at the house, momentarily shutting down the argument. Not for long, though, as it turns out Carol has just discovered she’s pregnant and Bob is the father. 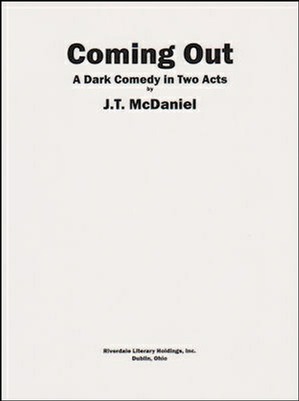 Coming Out: A Dark Comedy in Two Acts, is available in three editions. The 8-½ x 5-½ Reading Edition and the Kindle Edition contain identical content, including the play, production history, author’s notes, costume and set notes, and furniture and properties lists. The 11 x 8-½ Acting Edition is set in standard Dramatists’ Guild format, printed on one side of the page only, and is intended for use by companies performing the play. The Acting Edition contains only the play, with no extras. Coming Out is also available as a novel, which somewhat expands the scope of the work, as it is able to include background and scenes that are impractical to present on stage. The novel is available in both Kindle and trade paperback editions. If interested in producing Coming Out at your school* or theater, please complete the form on the play’s website. If you want to option TV or film rights, contact me directly using the email on this site. *Coming Out contains adult situations and language. I don’t really recommend high schools tempt fate by trying to produce this play, particularly as you will not be given permission to make any changes to eliminate the parts or words your local administration might object to.